The head of sailing’s governing body threatened yesterday to move all Olympic sailing events out of polluted Guanabara Bay unless the water is cleaner and floating rubbish is removed for next year’s Rio Games. “If we can’t get the water to a level, then we’ll move it outside (to the Atlantic Ocean) — for sure,” Peter Sowrey told The Associated Press on the final day of an Olympic test event. He also complained he received no data during the week-long Olympic test from the state body that monitors water quality. A check of the website for Inea — the state institute — showed it had reported water quality on the bay only once in the last 10 days. Rio’s pollution has been in the spotlight since an independent five-month analysis by the AP published July 30 showed dangerously high levels of viruses from human sewage at all Rio Olympic water venues for sailing, rowing, canoeing, triathlon and distance swimming. Sowrey said the closely watched sailing test event had gone “pretty well” from an operational viewpoint. But he said there was still too much raw sewage being pumped into the bay, and too much floating debris that makes fair racing impossible. “If we can’t get it clean, we’ve got to do something,” he said. “Yes, you could sail all the competitions outside,” he said. 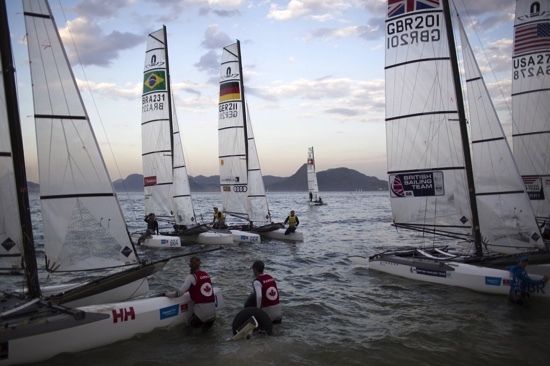 “ISAF should demand it be moved because Rio 2016 did not live up to their obligations,” Henderson said in an email to AP. He said he also fears the water issue could distract from next year’s Olympic sailing, turning the event into a debate forum on sanitation and pollution.